I was nineteen when I took custody of Lipher. 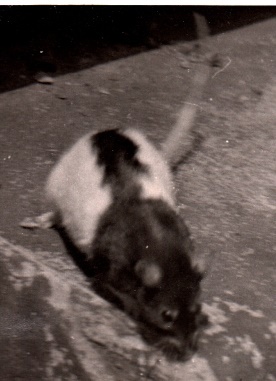 She was a lively, loving black and white rat. Right from the start she was amazingly tame, affectionate and craved human company. She liked exploring and would come and snuggle up to you. Her way of greeting was to run up your leg, up your body and on to your shoulder where she would chunter into your ear and nibble your ear-lobe. I lived in a single, pokey room that was shared with my friend Pete (who filled the tiny space with harmoniums, home-made mando-lutes and guitars). Lipher lived in a bird-cage on the side with the door open. She would sit on top of her cage and survey the room, or run around, climbing on every surface. If you left soap out she would pick it up and hold it in her paws like a squirrel and nibble it. She also had a penchant for tooth-paste. I used to head off at weekends to see my girlfriend (now wife) and leave Lipher in the room on her own. When I came back she’d bound down off her cage and bounce across the room, claw up to my shoulder and chatter into my ear. She was so overtly pleased to see me. One of the guys who lived upstairs collared me one day and said: ‘You do know that your rat always comes up to spend the weekend with us when you’re away?’ I didn’t know. But shortly after I left Lipher had worked out that I was off for a weekend, probably by what I was carrying, and made her way upstairs. She scratched on their door until someone let her in and then spent the weekend being pampered. She was always back before I returned. I’d have never known. It was as if she was psychic. Lipher was a clever creature. One day, in the midst of freezing winter, I’d returned after a weekend and Lipher bounded across the room. She stopped halfway and scooted off under the bed. I couldn’t figure it out. She’d never behaved like that before. It wasn’t until later, after I’d coaxed her out, that I discovered the reason. I’d left my new ankle-length sheepskin coat on the bed. Lipher must have been freezing; she’d chewed a hole in the coat and made a warm nest out of the fur. Somehow she had known it was wrong. I used to take her out for walks. She’d sit on my shoulder, hiding in my long hair and peering out. She loved it. One day I went in a baker’s shop. As a student with no money we were always going round looking for the stale bread and cakes or bacon ends. We scavenged. The shop assistance noticed Lipher’s little head poking out and beamed. She tickled her on the head and asked what she was. Was she a hamster? A guinea-pig? I told her she was a rat and the woman jumped back and screamed. Lipher was one of the best pets I ever had – intelligent, affectionate and loyal. But rats only live two to three years and she developed cancer. I had to take her in to have her put down. I’ve rarely been more upset. ← The Purpose of Life – Religion and Hardwiring. She sounds like a sweetie. I used to have 6 pet rats…I love them! They are such intelligent and interesting creatures. She was a sweetie. I still am very fond of her. I have had other rats as pets but she was the best – among my best pets of all time. I don’t know why rats get such a bad press as pets. They are clean. They don’t smell and they are very affectionate. Ideal.